“obotics developers are off to the races creating autonomous machines of the future. We’re fueling their efforts with the NVIDIA Isaac SDK, which will be publicly available soon as a free robotics developer toolbox for accelerating innovation and deployment. NVIDIA founder and CEO Jensen Huang announced the news today on stage to a packed crowd at our GPU Technology Conference. Building robots has historically been difficult. Delivering robot intelligence has been deterred by a lack of unified and easy-to-use software and hardware platforms. Robotics development at scale has, until recently, required custom programming to simulate robots in operation. The Isaac SDK robotics developer toolbox changes that — and moves to general availability in April. This toolbox offers developers access to Isaac applications, Gems (robot capabilities), a Robot Engine and Sim. It will save manufacturers, researchers and startups hundreds of hours by making it easier to add AI for perception, navigation and manipulation into next-generation robots. At the core is Isaac Robot Engine, which enables developers to build modular and high-speed robotics applications easily deployed to Jetson platforms, including our robot reference designs. There’s also more than 20 GEMs, providing plug-and-go functions for hard robotics problems such as navigation and perception algorithms. GEMs are essential and fundamental robotics algorithm modules that are built and optimized for the NVIDIA Jetson AGX platform. What the industry has previously lacked was a complete platform built on an ecosystem of trusted industry-standard software and hardware. 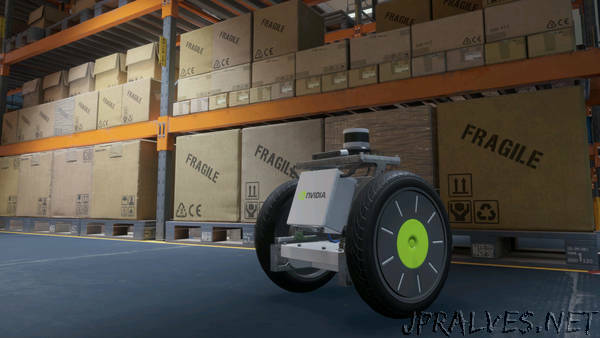 Developers can use the Isaac SDK robot developer toolbox to create applications with our Carter autonomous delivery and logistics robot, based on Jetson AGX Xavier. Jetson Nano comes in two versions: The $99 developer kit is ideal for makers, developers, learners and students; The $129 production-ready module is for mass market AI products needing horsepower at the edge. The Jetson Nano Developer Kit is available now. The Jetson Nano module will be available June 2019. GEMs are essential and fundamental robotics algorithm modules that are built and optimized for the NVIDIA Jetson AGX platform. For e.g. GEMs enable developers to easily add SLAM navigation features — obstacle avoidance, lidar-based localization, path planning and map creation — and interactions with humans such as voice command detection. Isaac Robot Engine delivers to users advanced monitoring and debugging capabilities required to build complex and highly parallel compute graphs. Capabilities include logging and replay of sensor data, efficient memory management and live web-based visualization. Isaac Sim allows developers to test robots — without breaking things — in simulation. Once tested, applications can be deployed on robots running on Jetson. Isaac Sim is a virtual robotics laboratory, a rich 3D world simulator that enables research and design for robots of the future at lower cost and time than would be possible without simulation.